At the beginning of the year, bitcoin was all over the news. And why not? The cryptocurrency had appreciated 1,300% in the last year alone! However, 2018 has been a big disappointment for anyone who bought in at what turned out to be the height of the bubble. Bitcoin has lost nearly half its value so far this year. And because it has no earnings and no revenue, it’s anyone’s guess whether it will bounce back up or continue to fall. Luckily, there’s a whole world of investments that are easier to evaluate than bitcoin. We asked three of our Motley Fool investors to choose a stock they think is more likely to outperform than bitcoin. They came back with Match Group (NASDAQ:MTCH), Urban Outfitters (NASDAQ:URBN), and iRobot (NASDAQ:IRBT). Here’s why they think these companies are better buys. Bitcoin has lost 47.8% of its value so far in 2018. Image source: Getty Images. 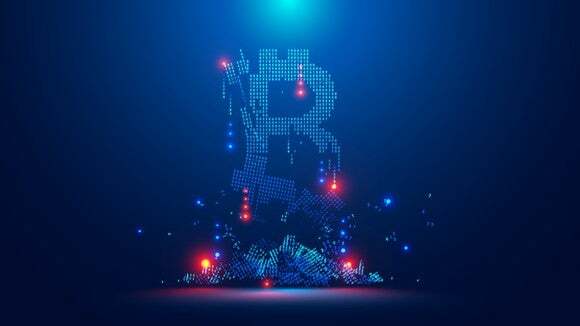 Jeremy Bowman (Match Group): Bitcoin may have broken a few hearts this year, but one stock that is still making investors swoon is Match Group, the owner of online dating platforms like Tinder, OkCupid, and Match.com. Shares of Match Group have tripled over the last three years as the online dating specialist offers a rare combination of attributes. It’s a fast-growing, disruptive leader that’s profitable and trading at a reasonable valuation. Match’s recent growth has been driven by Tinder, the app that made the phrase “swipe right” part of the language. In its most recent quarter, revenue jumped 36% to $407 million. That was the company’s fastest quarterly growth since its 2015 IPO, as new features like Tinder Gold and Tinder Boost have helped monetize the popular app. Meanwhile, Match Group’s operating income nearly doubled in the period as its operating margin jumped from 20% to 28%, showing off the company’s substantial operating leverage and pricing power. As with other subscription businesses, Match Group’s profits should grow faster than revenue because there is little marginal cost to add incremental users. The stock plunged in May when Facebook said it would launch a competing dating product. But that social network’s struggles with privacy issues following the Cambridge Analytica fallout and other revelations would seem to quash Facebook’s potential to unseat Match Group as the industry leader. Match itself benefits from network effects, and many online daters use more than one service at a single time, meaning this is not a zero-sum game. 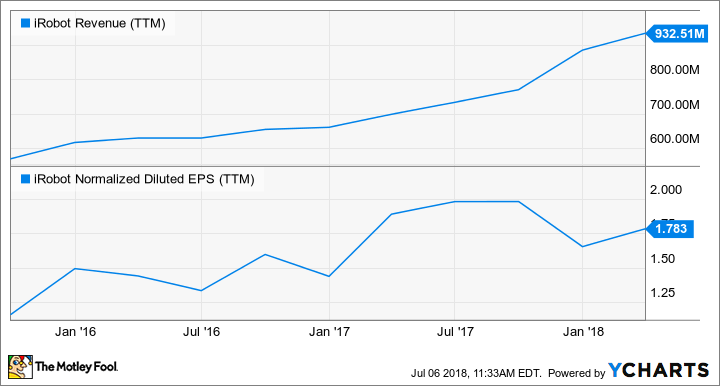 Match has since recovered most of those losses, but there’s still room for the stock to go higher, especially since it trades at a P/E of just 32.7 based on this year’s expected earnings. Rich Smith (Urban Outfitters): Clothing retailer Urban Outfitters was down as much as 39% at one point last year, and suffering along with the rest of brick-and-mortar retail from the Amazon onslaught. But in one of the most surprising success stories of 2017, Urban Outfitters ended the year up 23%, after a Q2 earnings report showed new life returning to its same-store sales. Urban Outfitters shares haven’t looked back since, gaining a further 27% since 2018 began. The company’s last quarterly report showed a 10% increase in comps, and a 12% increase in total sales. And earnings per share leaped to $0.38 — from just $0.01 a year earlier. Urban Outfitters appears to be on a roll, and there may be room for even greater growth. According to S&P Global Market Intelligence data, the company generated positive free cash flow of nearly $260 million over the past year, helping Urban Outfitters to maintain a debt-free balance sheet — and giving it a 17.1 ratio of enterprise value to free cash flow. Analysts predict the company will grow earnings at 15% annually over the next five years, putting the shares close to “buy” territory. Relative to bitcoin, which doesn’t actually earn anything, I think it’s a better buy. John Bromels (iRobot): Bitcoin shares might rebound, but it’s unclear what — if anything — might cause that to happen. On the other hand, shares of robotic vacuum manufacturer iRobot seem ready to soar, thanks to consistent outperformance. IRBT revenue data by YCharts. TTM = trailing 12 months. iRobot’s Roomba has become synonymous with the robotic vacuum, so it’s hardly surprising that it’s the market leader. Even with increasing competition from heavyweights like Korean appliance manufacturers Samsung and LG, the company has still maintained a hefty 62% market share. And that market is likely to grow: Research firm TechSci Research estimates that the robotic vacuum market will have a compounded annual growth rate of 13% through 2022. However, the most exciting growth prospects for iRobot probably lie in related products, in which it can use its existing technology. The company has already introduced robotic mops and pool cleaners, and rumors abound that a robotic lawn mower could be next. With those kinds of solid growth prospects ahead, iRobot makes bitcoin look even more like a gamble that isn’t worth taking.